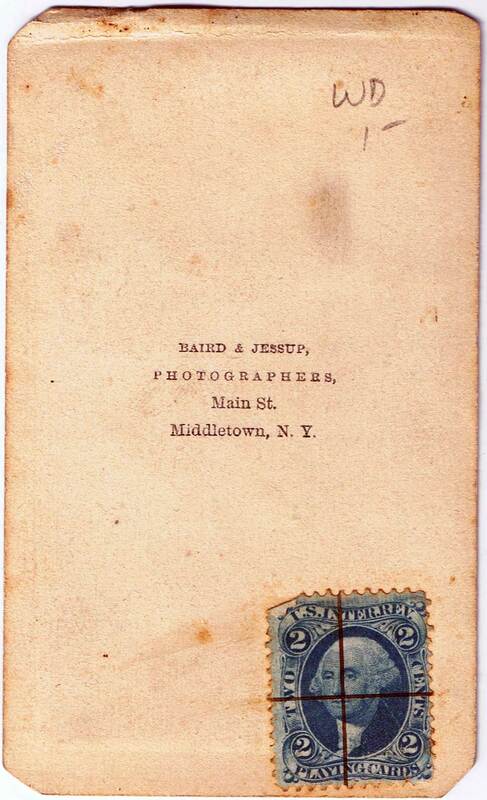 Backmark: “BAIRD & JESSUP, PHOTOGRAPHERS, Main St. Middletown, N.Y.” 2 cent “Playing Cards” stamp, blue. 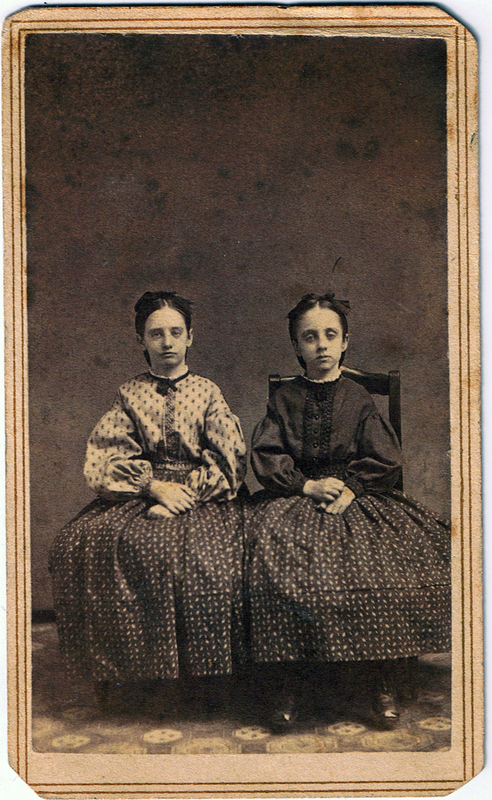 Subject: two girls aged about 9-13. Note: These girls are probably sisters, based on their matching skirts. Wears a printed bodice with very low armscyes, full sleeves pleated into the armscye and pleated or gathered into cuffs. The bodice opens in front, and the fullness at the waist is gathered into a waistband. The bodice is trimmed with soutache sewn in what appears to be a figure 8 pattern, matching her sister’s. The soutache covers the front placket, the waistband, and the cuffs. She wears a short, ruffled standing white collar based into her bodice, and a narrow neck ribbon tied in a bow at center front. Her skirt is pleated into a waistband hidden by the bodice waistband. There appear to be tucks near the hem of the skirt.. Her shoes are not visible. Her hair is parted in the enter and pulled back into a low style, covering her neck. She wears a hairnet with a decorative ribbon bow at the top. Bodice is of a plain fabric, and closes up the front with visible buttons. Soutache flanks the placket on either side. Her boots are leather, lace up the front, and are probably tipped with black patent-leather.